Each week this first quarter Faith Lutheran School of Plano has been meditating on one of the Ten Commandments. This week we focus on the eighth commandment: You shall not bear false testimony against your neighbor. 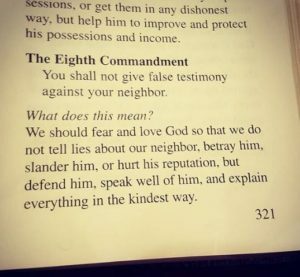 The meaning of this commandment is summarized this way: We should fear and love God so that we do not tell lies about our neighbor, betray him, slander him, or hurt his reputation, but defend him, speak well of him, and explain everything in the kindest way. This commandment is broken with our words. Words that harm our neighbor’s reputation include when we tell lies, half-truths, or frame a story that puts a poor light on someone. Sometimes we betray our neighbors by making a private or semi-private issue a public one. At other times, we rush to a judgment, complain about them, and gossip. Social media can be used to label and demean particular faults of our neighbor by taunting them and encouraging others to act against them. We are even tempted to bully them in person and speak down to them. “Do not lie to one another, seeing that you have put off the old self with its practices” Colossians 3:9. “Whoever goes about slandering reveals secrets, but he who is trustworthy in spirit keeps a thing covered” Proverbs 11:13. Avoid participating with evil doers. The Eighth Commandment protects your and your neighbor’s reputation. That is a beautiful thing. “A good name is to be chosen rather than great riches, and favor is better than silver or gold” Proverbs 22:1. “Open your mouth for the mute, for the rights of all who are destitute. Open your mouth, judge righteously, defend the rights of the poor and needy” Proverbs 31:8-9. Speak the truth in love (Ephesians 4:15). Encourage one another as the body of Christ that you may be built up toward the mature fullness of life that we have in Jesus Christ. Speak up for the one being slandered. Love your neighbor as yourself. Your Lord Jesus was betrayed and false witnesses spoke against him. This He suffered and much more, even crucifixion. Why? For you. For your redemption. To cast your eighth commandment sins as far as the east is from the west. To declare you His saints. ← Treat-N-Feast Fall Festival: 10/26/18 Open House: 11/4/2018 → This entry was posted in Classroom News. Bookmark the permalink.